Currently these Banana Republic ballet flats are my go to shoes. The Cheetah print has a faux faur texture that is really nice and chic. It is lightly padded however there is no arch support. 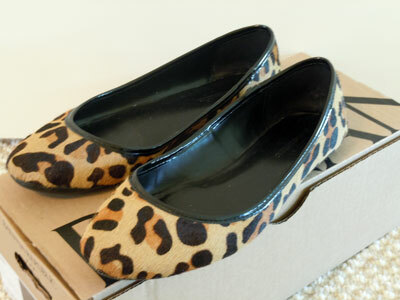 I can’t tell if this is Cheetah or Leopard except BR lists it as Cheetah on the shoe box. Walking in this pair is very comfy for short walks. When I do stand too long or walk for long period of time (1 hr or more), my balls of my feet begins to hurt. I’m thinking of putting some Dr. Scholl’s in them for more padding.